Have you ever heard of the saying: “if you fail to plan then you plan to fail?” It might sound cliche, but I think its applicable to many situations in life. Whether your goal is to become financially secure for retirement, lose weight, purchase a home or more recently set a New Years Resolution—it all starts with a plan. You have to know how you will get to that goal. Writing a book is the same way. If you’re one of the millions of people that say “I should write a book,” but then never sit down and create a plan on what your next steps should be, chances are you won’t ever write your book. But, with a proper plan in place and some tips on where to start, you can finish your book within 1 year. Do you know what the hardest part about writing a book is? It’s making the decision to do it. You’ve probably had the idea for your book for a long time. I bet it’s been percolating in your head, banging against the doors to come out. At times it probably drives you crazy, but books don’t write themselves, and the only way yours is going to get written is if you make the decision to do it. You have to decide to write your book then figure out how to start writing it. It’s your story. Only you can write it. Whenever I travel, it seems I am seated next to chatty types, and it’s fun to get acquainted. On one particular flight, I sat next to Don, and when he asked me what I do for work, I explained that I help people who aren’t writers become authors of high-impact nonfiction books. I hear that a lot. A lot of people say they want to write a book. “Then why don’t you?” I asked. “I’ve never really looked into it,” he said. His answer spoke volumes. Don had flirted with the idea of writing a book, but he’d never taken it further than just that — the idea of writing a book. People tend to glamorize the writer’s life and don’t realize that it’s a lot of hard work and it takes a lot of time. Don never made the decision to write his book, so in all likelihood, it will never get done. If he cannot make the decision to write a book, he’ll never know how to start writing it. That makes perfect sense to me. If you’ve never written a book, how would you know how to start writing one? Writing is hard work and the publishing industry is complicated. Some people sit down and start writing first, but they soon find that all those ideas that have been rattling around in their head have no form, no shape. What comes out is like a spaghetti mess — a bunch of threads that aren’t connected to one another. It’s frustrating. They know they have a message, but they don’t know how to get it down on paper. That’s not how to start writing; you need a plan before you put words on paper or on a screen. The problem with the “write first” approach is that it’s like trying to build a house without any plans. You have no blueprint to follow, no foundation poured, and you have no idea what the house will look like when it’s finished. I don’t know a lot about building, but I know you never put up the walls first. They have to be attached to something solid, so you pour the foundation first. But even before that, you need a comprehensive plan, or blueprint, that shows where each room will be and what features it will have. Before you pull out your hammer, you have to have a plan. The same is true for your book. If you want to save time, energy, money, and frustration, you begin with the end in mind. You take the concept for your book and turn it into a concrete plan. To do that, we start with the foundation. Perhaps you know the topic of your book, but do you know what you want your book to accomplish? The book must have a purpose, or there’s no reason to write it. Believe it or not, the purpose isn’t always easy to figure out, at least not without some concentrated effort. Why do you want to write this book? What is your motivation? What purpose will the book serve? How is it different from other books published on this same subject? What new information or angle does your story present that hasn’t already been heard? What is the main theme of the story, as you see it now? What are the secondary themes? Who is your audience? Be specific. Define your primary and secondary markets. How will this work impact that audience? What change do you want to invoke in the reader? Why will people want to read this story? Why would they recommend it to others? What is the pivotal moment in your story? Write a Purpose Statement for the book that begins with, “The purpose of this book is to …” and list the primary and secondary purposes that you have identified. Write a two- to three-paragraph synopsis of the book. Write the copy that you envision appearing on the back cover of the book. Who do you want to endorse the book? These questions will help you crystallize your message and figure out how to start writing. Beyond that, you need a process you can follow that will get you on the right track and keep you there. In my Group Coaching classes we create a BookMAP, which is a visual representation of your entire book. We map out all the contents of your book before you write a single word. Then, when you are ready to write, you follow your BookMAP, and even if you only have 15 minutes, you can write something to contribute to your book. A new year is upon us, and you can make 2019 the year you finally write your book that will establish you as an expert in your field, raise your credibility, and attract a following. We’re here to help! In fact, a new Group Coaching class begins in January, and you can join now. 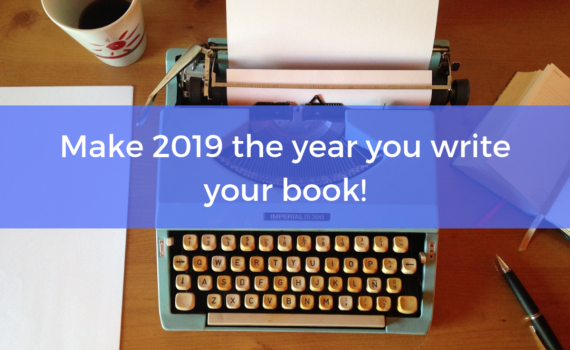 Make 2019 the year you finally write your book!